This is the first image ever of a black hole. The EHT (Event Horizon Telescope) captured an image of the nearby elliptical galaxy Messier 87’s (M87’s) supermassive black hole in the center of the Virgo galaxy cluster, 53 million light-years away. It was revealed today (April 10, Wednesday) in multiple press conferences around the world, and was the result of a global collaborative effort from over 200 scientists working with the EHT. The speed of light is the Universal speed limit – nothing can travel faster than light. In the vacuum (commonly denoted c), its exact value is 299,792,458 meters per second (around 186,000 miles per second). In other words, if you could travel at the speed of light, you could go around the Earth 7.5 times in one second. The endless depths of the sky intrigue almost all humans alike. Space is like an abstract dream coming to life when it unfolds into a number of unseen horizons. The enormous nebulas, staggering hypernovae and the smattering of countless planets and stars make it a canvas of muse. We are but a speck of dust in a desert full of possibilities when compared to the vastness of space. There are many realities prospering in the skies above us, it is only natural that we are still unaware of the majority of phenomena taking place on and around the stars. 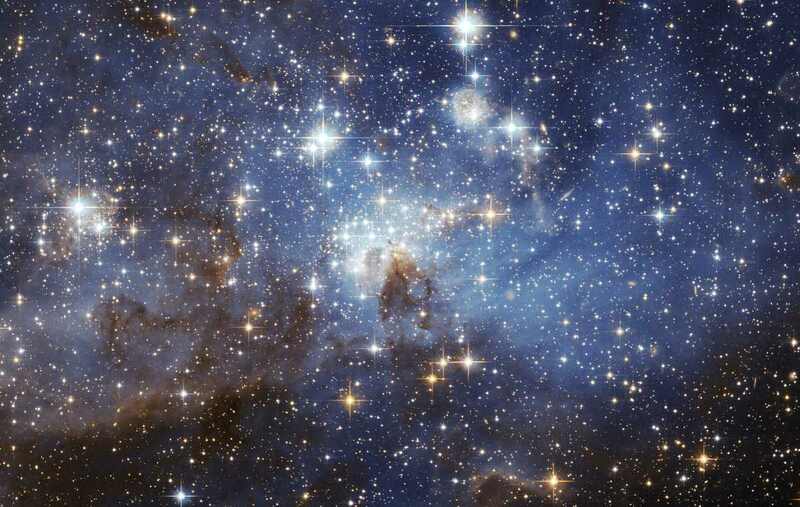 Just like the count of stars, there are unlimited obscure and consternating facts dwelling in the depths of space. Most of them are surprising and are reminders for us that we are just an addition to the universe. Let us take a swim into the sky with these 10 amazing facts which are bound to fascinate you. In April 2018, the European Space Agency’s Gaia observatory released its second data catalog, which includes the distances to over 1.3 billion stars. In the video published by the American Museum of Natural History, museum’s astrophysicist Jackie Faherty breaks down why this information is so revolutionary and explains how this information is helping scientists and non-scientists alike understand the universe like never before. For centuries, humans have endeavoured to discover and describe the sum of Earth’s biological diversity. Scientists and naturalists have catalogued species from all continents and oceans, from the depths of Earth’s crust to the highest mountains, and from the most remote jungles to our most populated cities. This grand effort sheds light on the forms and behaviours that evolution has made possible, while serving as the foundation for understanding the common descent of life. Until recently, our planet was thought to be inhabited by nearly 10 million species (107). Though no small number, this estimate is based almost solely on species that can be seen with the naked eye. What is the biggest star in the Universe? In fact, it is really hard to give an exact answer to this question since the universe is big, neighboring and the other galaxies are billions of light years away from us. But, we can give it a try. Here are the top 6 biggest stars in the Universe currently known by radius. The Sun is the primary source of energy for Earth’s climate system, and the life on Earth. With a diameter of about 1.39 million kilometers (864,337 miles, i.e. 109 times that of Earth), and a mass about 1.9885×1030 kg (330,000 times that of Earth, accounting for about 99.86% of the total mass of the Solar System), it may be the biggest thing in this neighborhood, but it is actually just a medium-sized star among the hundreds of billions of stars in the Milky Way galaxy. In the video published by the CAMENGAT creative astronomy below, you can see some dwarf stars and other giants compared to the Sun at the edge of its sphere: at 150 million kilometers (1 AUNotes 1) with a 50 mm objective. The stars are the Sun, Alpha Centauri A, Sirius, Vega, Pollux, Arcturus, Aldebaran, Rigel, Antares, and Betelgeuse. The scenario: Astronomical Observatory of Paranal, Chile. ESA’s (European Space Agency) Gaia spacecraft has created the most accurate and detailed map of the Milky Way galaxy (and beyond) to date. The map includes high-precision measurements of nearly 1.7 billion stars and reveals previously unseen details of our home Galaxy. It is the second iteration of the map and published by ESA on April 25, 2018. Want to Become a Citizen Scientist for NASA? You can help NASA on some projects: for instance, citizen scientists helped NASA identify an aurora-related celestial phenomenon, now called STEVE. Want to become a citizen scientist? You can find projects on the NASA website.